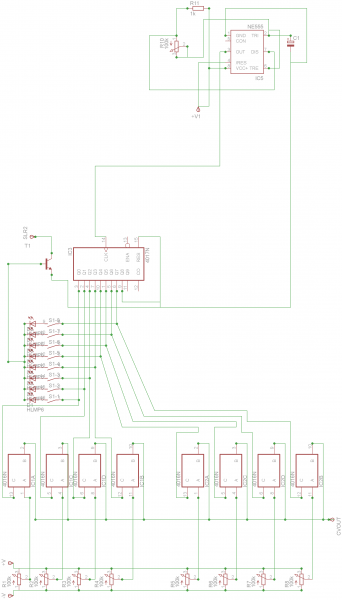 I downloaded that, looks great, Is there a function where you can automatically lay out a stripboard design from the schematic? I can't find a way. No. That part you have to do yourself. I am thinking of making a program to do exactly that, using a genetic algorithm. Shouldn't be too hard IMO. "Posthumanity is a discrete set of processes with arbitrary return codes." That would be superb! Maybe reply in This thread and let us know your progress (keep this sequencer thread on topic). I would be happy to beta test though if it's going to be a mac compatible program. To conclude this then, the program will be multi platform, open source and free. I will make it in Java or FreePascal. I don't have the time right now to start this project but sometime during 2009 it will be finished. I will keep you posted. If anyone feel the urge to program this themselves, feel free to contact me for exchange of ideas! not sure if this thread is still running, but i have a couple of questions i'd like to ask about building sequencers.. i have only got into this whole thing quite recently..
firstly, i have built basic square wave oscillator that goes from 100-1000Hz based on a schematic i found in a book of 555 projects and im interested in building an 8 step sequencer to run it off..
looking at some of the posts on this thread, and looking at various "knight rider lights" projects, i think i have a basic idea of what i want to do..
i juts have a couple of questions about how it all works..
if i build another 555 oscillator, would that be sufficient as a clock signal for the 4017? is it each pulse of the square wave that triggers the steps of the 4017? what would be a useful range of frequencies for the clock signal so as to be able to vary the step speed a decent range? also, im a little confused about what happens after the 4017..
is the input voltage just re-routed to each of the pins with each step? so does that mean, in order to control the oscillator i just need to hook up each of the outputs from the 4017 via a diode to the V+ of my oscillator circuit? what would be the effect of putting a pot between each step of the 4017 and the oscillator? would that cause the frequency of each step to be different, still using just the one oscillator? sorry if my questions seem obvious or confusing, i just want to get an understanding of what is actually happening between the 4017 and the oscillator.. i suppose i could just breadboard it and muck around, but i dont really want to spend the money on the components til i have an idea of how it all works.. I'll try to answer some of your questions. First I would recommend a little research on your part. Look up the "baby 10" sequencer, both on this board and on the internet. Then look up the basic 8 step or 10 step sequencer on the "Music From Outer Space" or MFOS website. Ray has a wonderful way of explaining his circuits that may well answer a multitude of questions. a basic squarewave oscillator will work well to drive the 4017 based sequencers. Although the speeds you mentioned are a bit too high. This driver oscillator is also known as an LFO, or Low Frequency Oscillator. for sequencing purposes you might want it to go from very slow (1 Hz or maybe less) up to 50-60 Hz? depends on what effect you want. The 4017 is effectively a clocked switch that changes or switches the input voltage to an output port at each cycle of the clock. If you connected each output of the 4017 directly to the output or Voltage Controlled Oscillator the tone would be the same at each step. Using a Potentiometer or variable resistor at each output step allows you to vary the output voltage at each step and produce different tones. Take a look at the resources cited above and let us know if this helps. thats basically everything i wanted to know.. at least now i can get the components and do a bit of experimentation.. i had read the article on the baby 10 and a few others, but none seemed to mention what actually happened between the sequencer and the tone oscillator..
Gus. Great to have you hear. Glad to be of service. Enjoy the experiments! The original link is long dead. Posted: Thu Sep 10, 2009 12:45 am Post subject: more sequencing/logic gate questions..
thanks a lot for all your advice before, it was greatly helpful! i succeeded in making a simple 4 step sequencer on a breadboard, but didnt go further because i havent decided exactly what i want to do with it yet..
i have a question though, which might be very stupid and impossible to do, but im just wondering if it could be done..
i just recently got my hands on a friend's roland SH-1000 synth, and its great, but unfortunately it has no CV input, so im not sure how i could use the sequencer i built with it..
is there a way that i could use it "at the other end" so to speak, so instead of using the sequencer as a control voltage, to put an input jack in the sequencer and make the circuit such that the signal from the synth will only get to the output jack on the sequencer if the step is switched on? at uni we're just starting to learn about mechatronics and logic gates and things and i was wondering if i could use an AND gate with the output of the sequencer in one input and the signal from the synth in the other, so that it would only output anything if both inputs were true..
first of all, would this work at all? and secondly im not entirely sure of how an AND gate works, if both inputs are true, which of the inputs is allowed to go through? or are both? and if that is the case, would it make a difference to the output if the signal coming from the sequencer is added to the signal from the synth? is there a type of gate that when both inputs are true, it only lets one of the inputs through and uses the other input just for a control? so many questions! sorry if its confusing, im having trouble putting what i am thinking into words, just trying to get my head around it.. if its possible it would be pretty useful, as you could use it with guitars or anything that has an output voltage..
i guess the basis of what i want to make is something that can interrupt the flow of a voltage at selectable equal increments.. Sorry to it took so long to get back to you Gus. I think what you would need for your latest idea would be a VCA. Voltage Controled Amplifier. By controlling the VCA with a clock signal or in your case one of the outputs of the sequencer, you can turn on or turn off the signal being passed through the VCA. Musically, Don't know how usefull that would be. Seems like a 1 year resurrection is in order! I've been following this thread for a while, and wanted to thank all of you for the wealth of information, I couldn't have gotten as far as I have on my own! And now for the problem... I've built a basic version of the rev2 baby 10 sequencer. Mine has 4 steps at the moment, is running off 9v, no step advance, no trigger converter, and only 1 cv out. I can't seem to get this thing to trigger a monosynth [the Moog MG1 in particular] correctly. Trigger works just fine coming from the 555, but the gate signals seem to 'pile up,' I.e. the first step triggers a different note pitch, but the next pitch is absurdly high, and so on until the generated cv signal is a high pitched whine. It's like the CV isn't taking a rest between each step. Any ideas where I might have one wrong? Something to do with the 'ENABLE IN' pin maybe? it's just tied to ground right now. I believe that tthe MG-1 being a MOOG requires "S-Triggers" instead of standard gates to produce sound from external sources. Try doing a google search on S-Trigger converter to get started. I'm so close I can almost taste it! Thanks for the link! I tried both circuits on that page, and the s-trig signal is definitely a lot more stable for the Moog. But I can hear no pitch changes! I assume s-trig is only for the gate, but what about CV? The sequencer cv only yields differences in volume, not pitch. It works fine for gate; I must be missing something fundamental. Never mind! I had a few connections backwards. The sequencer is running like a boss. The pitch doesn't go very low though [even with the ocillators on their lowest octave setting]; just drops off at a certain point. As a result the MG1 sounds like someone with a stuffy nose. Don't have this problem with the Gakken SX150 though. It's a cheapo analog synth from japan that make some pretty killer basslines. Glad to hear you got results...keep experimenting! I went to panel mount the whole assembly, and then things got weird. I triple checked my wiring and everything looks ok. It steps in random patterns sometimes, and when I connect the reset pin to achieve different numbers if steps, it doesn't count as it should. The only thing that is different is that I wired the LEDs and pots grounds in series instead of in parallel. Would this account for the odd behavior? I think something is grounding in a way it shouldn't. Edit: It's definitely not counting correctly. What would make the 4017 step randomly, or just not include steps? Plugging in a jack into certain sockets [like gate out] results in variations of weird behavior. Just picking up on a very early post in this thread. I used the diode method, 1N4148's, of synchronising the 4 chips. It works like a charm. EDIT: Just checked the schematic. This was running a 28 output sequence to drive 14 LED modules back and forth. The 4 set could have run 33 outputs. Awsome sequencer ! is there any eagle or pcb layout here ? Shouldn't pin 13 (Enable) of the 4017 be tied to the (-)? For the past week or so, I have been trying to solve the problem of getting 8 step sequencers using4017s to run independantly, in series or parallel, depending on the situation. each of these applications are easy on their own, but getting them to work in series, and being able to switch them to either of the other two is a problem that is elusive. This morning I found the solution. Using the schematics on the previous page, which are available in the 4017 data sheet, trying to get what I was trying to achieve gives the problem of the last sequencer in the chain running on steps 2-9 to give the last 8 steps. This is problematic, for when one wants to use that sequencer independantly, as it does not fire on the first count. Other solutions leave the first step active when the chip is reset, giving an unwanted signal. My solution is to have the first and subsequent sequencers reset on the 10th step. This lets the 9th step send its signal to the first step in the next chip in the series, thus eliminating the always on problem of the first step in the series problem. when the chip is reset. One drawback of this solution is that there will be as far as I can tell, 5 connections for each module in the series. The next thing I need to breadboard, is adding a third sequencer in order to make sure that this will for more than two sequencers. But whats a modular without more spaghetti? I am trying to build a simple 8 step sequencer using one arduino for the timming and sequence block and then use 2 cd4016 to gate each potentiometer but seems to not works as expected. when I turn one of the potetiometers it afects the whole cv voltage of all steps, and the maximum voltage I get is around 1,5v and minimum 0,5v when only one potentiometer is at maximum (I am using the rails of the arduino, so a 0-5v range to power the pots). when I turn then all up I get almost 5v. I checked to measure if each pot is receiving 5v and when I check the middle pin of the pot seems to be doing what is expected, going from 0 to 5v.